Explore the fascinating world of tea in this illustrated book of recipes, history, and preparations—including reading tea leaves and Japanese tea ceremony. For centuries, tea has been known to promote health, harmony, and internal balance. In fact, the long lifespan of people in China has been associated with the population’s love of green tea. With either a stimulating or relaxing effect—depending on the length of boiling time—the vitamins and flavonoids in this infusion are not only healthier than coffee, but also help your body fight free radicals. 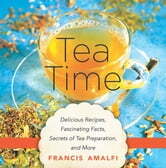 Over 60 recipes, including sangria tea, fajitas with tofu macerated in green tea, and many more!